Fairies are real, and they're all around us! Award-winning author-illustrator Phoebe Wahl offers a fanciful and beautifully illustrated peek into the hidden world of fairies, sprites, and other magical creatures. A girl searches for fairies in her backyard and the woods beyond, following little clues and traces of magic. Fairies and other magical creatures can be found on every page, hidden among the flowers, trees and pebbles. But although readers can see them, the girl keeps searching, just one step behind... In the end, it is clear (both to the girl and readers) that there is magic all around, even when it's hidden in plain sight. Phoebe Wahl takes us deep into the world of fairies, and her vibrant, multi-textured woodland scenes are every bit as enchanting as the creatures therein. A gorgeously illustrated paean to imagination and the natural world. 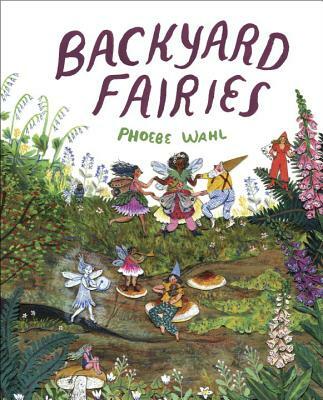 PHOEBE WAHL spent most of her childhood either looking for fairies or drawing them. She grew up unschooled in Washington State and credits her "free-range" childhood for much of her inspiration. Phoebe graduated from Rhode Island School of Design with a BFA in illustration. Her first book, Sonya's Chickens, received the Ezra Jack Keats Book Award for New Illustrator as well as starred reviews in Kirkus and School Library Journal. She lives in Bellingham, Washington.